Tuesday 22 March 2016: To celebrate a legacy of producing the world’s most richly flavoured single malt, Laphroaig announces the highly-anticipated launch of Laphroaig Lore, known as the richest of the rich. Lore :: A body of traditions and knowledge on a subject or held by a particular group, typically passed from person to person by word of mouth. 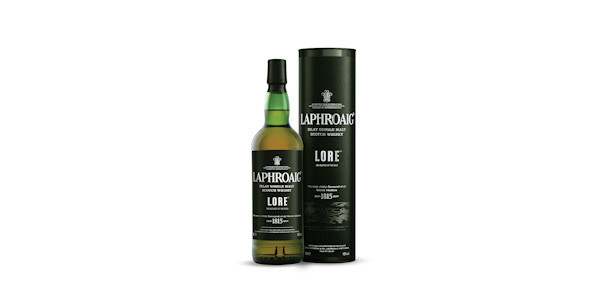 Distributed by Maxxium UK and crafted by Laphroaig Distillery Manager John Campbell, Laphroaig Lore is drawn from a variety of casks including first-fill Bourbon barrels, quarter casks and Oloroso Sherry hogsheads to create a unique richness. As the name suggests, this new expression is inspired by traditions and tales passed down from generation to generation of Laphroaig’s Distillery Managers since 1815. Legend has it the Laphroaig lore began around 1800 when brothers Alexander and Donald Johnston invented and crafted a recipe for an extraordinarily rich single malt, even before the Laphroaig distillery officially existed in 1815. The recipe was further developed and refined in the 1920s by Laphroaig Distillery Manager, Ian Hunter, who pioneered the use of ex-Bourbon casks. Further chapters were added by the 20th century’s only female Scotch whisky distiller, Bessie Williamson, and by luminaries such as Iain Henderson. NOSE: Rich and smoky with seaside minerals and a hint of ash and bitter chocolate drops. Vanilla follows with oily unroasted chestnuts and a hint of fudge with a malty sweetness. A drop of water adds a creamy clotted cream note with fruit appearing in the form of unripe citrus in a flan glaze. This finest of Scotch whiskies is bottled at 48% ABV and will be available in luxury retailers and whisky specialists including Hedonism and The Whisky Exchange from 22nd March 2016 (700ml) priced at £85 (RRP).